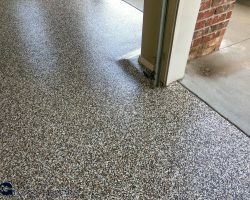 We are a concrete polishing company and epoxy flooring company proudly serving customers in Northwest Arkansas, (Bentonville, Fayetteville, Rogers, Bella Vista) Arkansas, Oklahoma, Missouri, Kansas, and Texas. Call us for your 100% free estimate at (479) 270-5000 or Toll-Free (888) 99-SHINE. 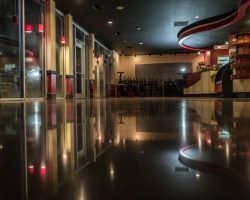 Find out more about our Polished Concrete and Stained Polished Concrete services in Arkansas, Oklahoma, and Missouri. These floors are excellent in any environment. Put the polished concrete flooring professionals to work for you today. 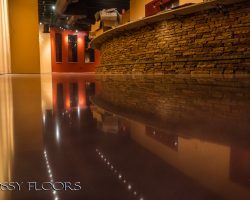 Find out more about our Stained Concrete services and get the floor of your dreams. Polished and stained concrete floors are some of the most beautiful floors in the world. Contact Glossy Floors today. Click here to learn more about our epoxy floors. The most unique floors in the world. 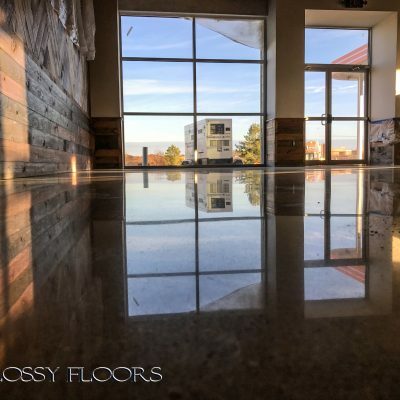 No two floors are ever alike, so call Glossy Floors or schedule a bid request so we can give you one of the most beautiful floors in the world. One of the 3 most popular colors in the Central United States is Walnut. Our Walnut stain goes with just about every commercial and residential concrete polishing project. We’ve polished more residential floors in Tulsa, Oklahoma with Walnut than any other color. It has a very soft hint of purple in the dye which is what gives it that Walnut look. Our Sand dye has been the single most popular stain since we began polishing concrete. It never seems to go out of style and, while popular just about everywhere, we have used Sand most often in and around the Northwest Arkansas area. Looking at our past projects, Bentonville and Fayetteville, Arkansas love Sand the most! Regular concrete can have a slight tan tint to it. It may appear gray at first, but once it’s polished, you can start to see the tan show through. Because of this, our 3rd most popular stain has always been Gray. It’s not too dark for polished concrete, but it stains the concrete just enough to tone down the brightness. Polished concrete floors are the result of diamond grinding a concrete floor with special diamonds. Polished concrete starts at a lower grit, and eventually ending up with a much higher grit. In our case, Glossy Floors starts the polishing process using low numbered metal diamonds, i.e., 20, 40, 80 or 150 grit. We complete the process by using resin diamonds, i.e., 50, 100, 200, 400, 800, 1500 and 3000. Polished concrete floors need to be ground down before the true shine takes place. There are plenty of three and 4-step systems out there, but true polished concrete doesn’t skip any steps. Call us at (479) 270-5000 for a free estimate. We service the entire Central United States. Including Arkansas, Oklahoma, Missouri, and Kansas. 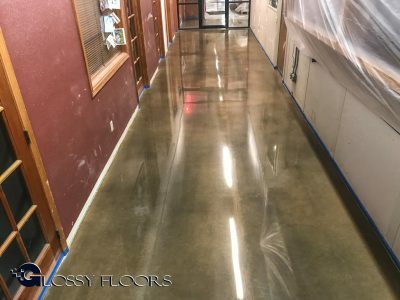 Call Glossy Floors today and get an estimate on your polished concrete, stained concrete or epoxy floor coating project. Polished concrete floors can range anywhere from $3.00 per square foot to $7.50 per square foot. Larger jobs have a tendency to be lower in price. Smaller jobs may incur a minimum charge. There are several factors that need to be considered before an estimate can be given. How many square feet is the project? What is the current condition of the floor? Does the floor currently have a covering? Tile, Carpet, etc. If there’s an existing material on the floor, who disposes of it? Who removes it? Are there expansion joints that need to be filled in? Is the polished concrete going to have stain or dye? Are there major cracks or holes? These are things that need to be answered before an estimate can honestly be given. If you’re interested in a showroom quality floor, visit our showroom floor pricing guide.